LDMOS RF power transistors are being used to modernize many military and commercial L-band and UHF radars as well as IFF/transponders that formerly used vacuum tubes or bipolar junction transistors. A new family of 50-VDC LDMOS transistors from NXP delivers new levels of performance at the frequencies between 900 and 1400 MHz used by these systems. One of the devices also boasts the highest RF output power of any solid-state device at these frequencies. GaN MMICs will be the defacto choice for generating power in the next generation of radar systems, but they offer no real benefit over LMDOS at L-band frequencies and below for several reasons. First, millions of high-power LDMOS transistors have proven themselves in applications such as cellular infrastructure in which they have been the predominant technology for more than two decades. In addition, radars other than those using the Active Electronically-Steered Array (AESA) architecture do not require the use of MMICs and thus can avail themselves of less expensive discrete LDMOS transistors. Finally, LDMOS currently delivers much higher RF output power than GaN devices and can withstand far higher impedance mismatches as well. And, when compared with vacuum tubes, solid-state devices provide major benefits in longevity, design simplicity, operation at low voltages such as 50 VDC rather than the kilovolts required by tubes, and solid-state amplifiers can be constructed of hot-swappable modules, allowing systems to remain in operation if a module fails. The high RF output power of the new transistors are in keeping with Department of Defense efforts to reduce the size, weight and power (SwaP-C) of its platforms by allowing amplifiers to use fewer devices to achieve a desired performance. This not only reduces amplifier size and board space but the bill of material and cooling overhead as well. 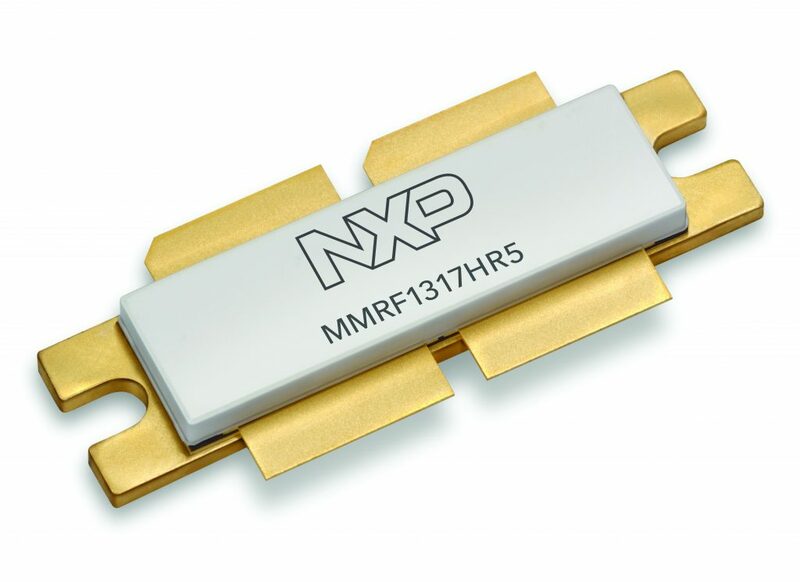 NXP’s new transistors include the MMRF1312H/HS, MMRF1314H/HS, MMRF1317H/HS, and MMRF2010N/GN. The MMRF2010N/GN is housed in an over-molded plastic package and the three other transistors are housed in ceramic air-cavity packages. All are designed to be used in L-band radars, IFF transponders, and distance measuring equipment (DME), depending on the device. The MMRF1312H/HS, designed for IFF Mode S interrogators, L-band secondary surveillance radars, and distance measuring equipment (DME), operates from 900 to 1215 MHz with a peak RF output power of at least 1200 W at P3dB, gain of 17.3 dB, and efficiency of 54%. The primary application of the MMRF1314H/HS is L-band primary radar and it operates from 1200 to 1400 MHz with a peak RF output power of at least 1000 W, gain of 15.5 dB, and efficiency of 46.5%. 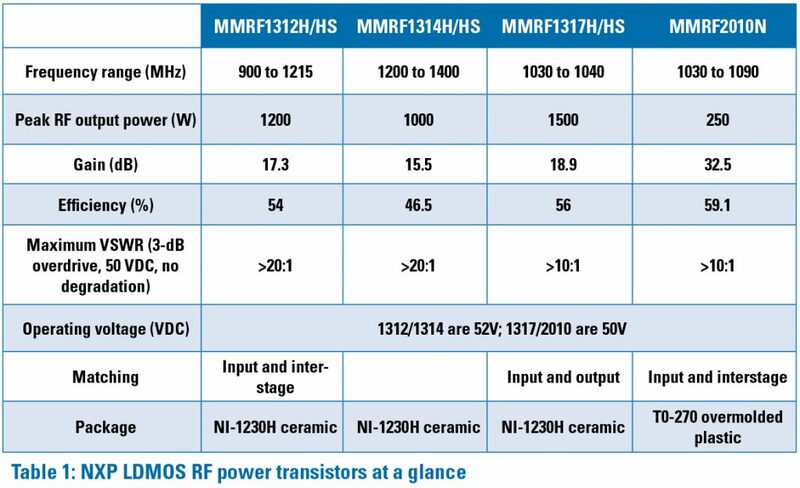 The MMRF1317H/HS delivers the highest RF output power over its operating frequency range of 1030 to 1090 MHz of any LDMOS transistor, and is designed for use in IFF Mode S interrogators and secondary surveillance radars. Its P3dB RF output power is at least 1500 W, with gain of 18.9 dB, and efficiency of 56%. Finally, the MMRF2010N/GN, whose applications are typically IFF Mode S interrogators and secondary surveillance radars, operates from 1030 to 1090 MHz with a peak RF output power of 250 W, gain of 32.5 dB, and efficiency of 59.1%. Although RF power amplifiers used in radar and IFF systems typically do not experience extremely high impedance mismatches (high VSWR), they are on occasion subjected to conditions well in excess of those encountered in systems such as cellular base stations in which operating conditions tend to be more consistent and stable. They can also be exposed to levels of RF input power well in excess of their intended values. When either of these conditions occurs, they can either degrade system performance or destroy the transistors. Like all of the high-ruggedness LDMOS RF power transistors in NXP’s defense and industrial portfolios, the new transistors can handle such conditions when they occur either alone or together. Not only can they tolerate them but also deliver their rated performance without failure. For example, the MMRF1312H/HS and MMRF1314H/HS will operate into a VSWR greater than 20:1 and the MMRF1317H/HS and the MMRF2010N will operate without damage into a VSWR greater than 10:1 at 20% higher-than-rated supply voltage and twice their rated input power. The MMRF1312H/HS, MMRF1314H/HS, MMRF1317H/HS and MMRF2010N join NXP’s expanding line of both LDMOS and GaN devices for defense applications, all of which are part of the company’s Product Longevity Program guaranteeing their availability for 15 years. The four new LDMOS transistors are currently in production and reference designs and other design tools are available. For more information, visit www.nxp.com/rf.